Now that you have more experience stitching needlepoint patterns, you’re ready to take on more challenging projects with a variety of stitch techniques, embellishment ideas and creative imagination that require greater skill than you've used in the past. If you've always wished you could needlepoint better, then these tips and tricks along with the beginner basics you already know will help to make your needlepoint projects even more exciting. Petit Point is a gentle and lovely reminder of another time and place when the art of needlepoint was fresh and new and stitchers took as much time as needed to complete a project. The stitch is simple, but the lessons you can learn from working a Petit Point project are huge! Experienced stitchers know how to bring classical needlepoint designs to life with the Petit Point technique. As they work, their skill level is increased as well as their ability to stitch with a smooth, comfortable rhythm. You can easily remove any fear of stitching on double-thread canvas by following the tips in this article. Projects worked in Petit Point are fun as well as exquisite enough to give to special people or to keep for yourself. You simply MUST try these popular needlepoint stitches! All 54 of them are fun to do, and most are quick to work. Experiment with as many as possible and add favorites to your needlepoint stitch collection. Experienced stitchers are very creative when choosing needlepoint stitches for projects. They pick from the basics as well as highly decorative techniques that will make the canvas come to life, even if it is hand-painted or an original design worked on blank canvas. Here's a quick tip for using unfamiliar stitch techniques. Try placing them at random, scattering them across the canvas and leaving empty areas to fill in with another technique you’ve chosen. You can also work them in arranged groups as you fill in various needlepoint design motifs. Cover any canvas that shows with tent or other compensating stitches as needed. and don’t forget the background fill area of a project. Many of the stitches can be used to give subtle depth to your canvas background. Break away from traditional #10- or #13-mesh needlepoint canvas and capture design details with finer mesh sizes of Penelope, Congress Cloth, silk gauze, perforated paper and other types of needlepoint ground fabric. Any size or type of canvas can be used to work a needlepoint project, and experienced stitchers take full advantage of this by working parts of a needlepoint design on smaller or larger mesh sizes; and then completing the background fill area on even larger mesh like Quickpoint canvas before finally attaching the worked design elements to it. In this easy-to-use reference, you are encouraged to experiment with all kinds of canvas, from plain traditional white to colored canvas, and even to try your hand at dyeing your own to create interesting design effects. To get the same successful results professionals do, experienced stitchers always mount their canvas on stretcher bars with thumb tacks for stitching. It has been proven by many needlepoint experts that working a project that has first been framed on stretcher bars minimizes blocking and saves time in the finishing process. Follow this informative guide to learn how easy it is to use stretcher bars, prepare the canvas for mounting on them, and the best way to achieve a taut fit. Add dimension to your projects and transform them from beginner to professional with surface embroidery techniques. Scatter these stitches around to your liking as you have lots of fun with this type of canvas embellishment. Play around with threads and found objects while experimenting with needlepoint couching. Attach tiny mirrors, coins and other unusual objects on top of basic tent stitches with fancy needlepoint Jessicas, the Rhodes Stitch and other techniques. Learn to use filling patterns worked with matte finish threads and decoratively couched with long stitches worked in shimmering novelty fibers. 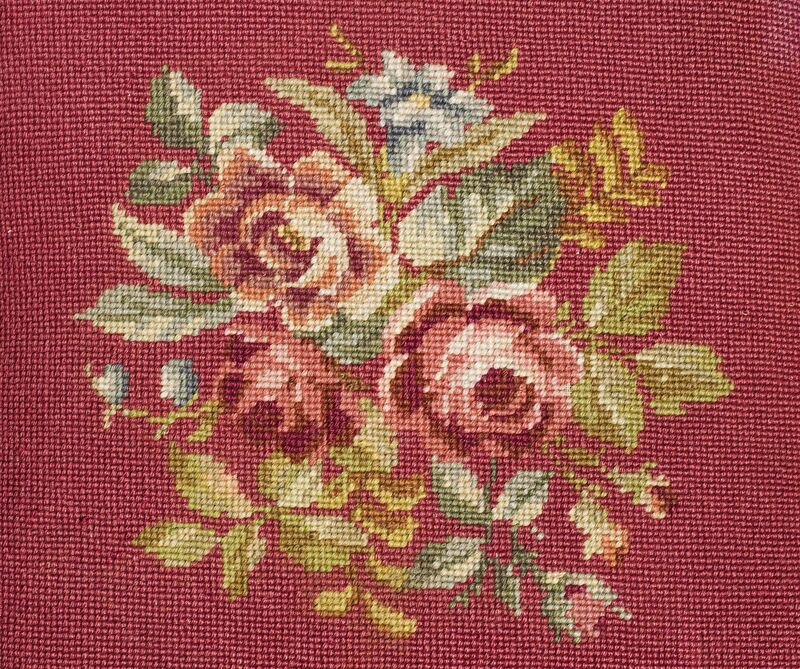 The finishing of a needlepoint project depends on how it has been stitched and its intended purpose. If you’re looking for an innovative way to finish completed needlepoint into items other than pillows, framed pictures or wall-hangings, then learning how to make a stand-up figure is just what you need. Ideal for holiday themed needlepoint projects like nativity figures, nutcrackers, teddy bears and other items sized perfectly for small toys and table-top home decorating, the tips and instructions in this tutorial show just how quick and easy it is to do your own finishing in a way that will take your needlepoint skills to the next level. You can showcase all your hard work by adding fancy trims, cording and even tassels to the finished needlepoint stand-up figure so that it looks as if a professional did it. Experienced stitchers do not panic when a mistake has been made—especially if needlepoint canvas has been accidentally cut. Small holes and tears are common and can easily occur if a mesh thread is unintentionally ripped while snipping loose stitching threads on the back of the canvas. Patching cut needlepoint canvas is easier than it looks. Even a novice can make a near invisible repair and fix damaged canvas with minimal fuss using these DIY steps. All you need is a little patience, a piece of scrap canvas and a few simple needlepoint supplies to make the canvas look brand new again.